Every training type needs different different safety features. For example, padding qua ntity is essential for your knuckles’ safety while punching heavy bag furiously. Also, after punching the heavy bag, same glove’s padding should return the original place before next punch. If it does not, then your glove starts to wear off and soon enough it will tear apart or lose its padding quality. Also heavy bag gloves should have wrist support to protect your wrists from serious injuries. According to sizing chart below, you can get your own pair. There are some heavy bag boxing gloves are far superior, you can check them and their features here. Safety features change a lot for sparring training. you won’t be needing thumb lock for heavy bag session, but you don’t want to blind your opponent right? This feature is necessary for your sparring partner and also padding quantity should be enough for not to knock out your partner. Also if the leather has premium quality (goat leather etc) you can expect to use sparring gloves more than 2 years. The sizing chart for sparring glove is below. Keep in mind that lots of gym only allow your to spar more than 14 oz. If you consider doing lots of sparring sessions, then have a look at best boxing gloves for sparring to protect you and your partner and get best experience in the process. These pairs are my favorites and quality ones are top notch. Actually these have been produced with more care than sparring or heavy bag gloves. Quality training gloves have every safety features and these are suitable for all training types including focus mitts, double end bag and punching bag. I really don’t like going gym with two gloves and if you are like me take a look at best boxing gloves for all training types and their features. Also, you can find sizing info below. There is not much things to say about these, they basically have minimal padding to hurt your opponent and have all safety features. Generally 8 or 10 oz are used in competitions depending on weight class. How often will you do boxing training? I have been doing boxing training at least 3 times per week for several years, of course if I am not sick 😉 With that, when I choose a pair I care about the durability the most after protection. Because when I get a pair with decent quality leather, I know I will pay more and I also know that it will pay off in future. This feature changes drastically a pair’s lasting period. Do you care about break in period? My all time favorite glove is Cleto Reyes Training Gloves and these gloves are handmade in Mexico. These provided me very good trainings . With that, if I remember correctly the break in period took more than 5 months. I don’t know whether you care about break in period or not but if you do, it is something to consider when you buy a pair. There is only a few brands which make always certain quality gloves, with that lots of brands have both good and bad products. Also there are some brands which are not so famous but they make quality gloves like Hayabusa. I hope you enjoyed reading and know more about which things to consider while choosing boxing gloves, if you have any questions please leave a comment below. how to choose boxing gloves? 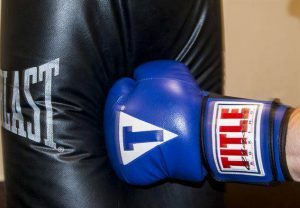 Next post: Title Gel World Bag Gloves Review, Are these Ideal for Heavy Bag? This article landed on my doorstep at the right time, I just got pain and am very excited about buying my first punching bag, but didn’t pay much attention to other important things…such as buying boxing gloves. This article will assist me so much when it comes to making the right choice in terms of all the factors that you mentioned. I would never have thought that one needs to factor in so many things. I’m quite a large individual who is interested in boxing for a half an hour a day for exercise, which brand would you suggest to me? Every training type needs different safety features and lets not forget features for the training performance 😉 so there are definitely things to consider. there are lots of brands for good protection. Hayabusa’s all gloves have all safety features. You can check out the review of it. Excellent and informative article unfortunately I am not a boxing lady. But! I have 6 active sons and 2 of whom love ‘sparring’ whatever that term maybe as they often use this term when referring to going of to their exercising gym. Don’t be surprised if you get a few Guttenbeil’s asking questions on your opinion regarding your products. I can answer their question anytime and they can have a look at kids boxing gloves review for more info as well.